Jarrow Roofing fell to their second consecutive defeat on Saturday, going down 3-1 at high-flying Morpeth Town, in Northern League Division One. Roofing went into the game on the back of an FA Vase exit at home to Seaham Red Star last week, though this week’s display was much more encouraging. The opening 10 minutes were a very tight affair with both sides getting into attacking positions regularly, though neither were able to find a killer final pass. The visitors appeared to briefly tire after that, perhaps due to the effort required to keep out Morpeth, allowing the side in second place going into the game to strike. On 16 minutes, Michael Chilton gave the home side the lead, after he latched onto a deep cross from the left side to head high into Dan Regan’s net from close range. Morpeth doubled their lead a minute later when, with their second cross of the game, Chilton was able to take the ball to feet and finish first time, gliding the ball into the bottom corner of the net. Two crosses, two goals. Morpeth controlled the next 20 minutes, with Roofing struggling to get the ball through to Paul Chow, playing up front on his own for the first time this season, but the visitors did manage to find the back of the net before the interval. Five minutes before half time, captain Alex White managed to half Morpeth’s lead as he arrived in the penalty area at the right time, allowing him to head a pinpoint Corey Barnes cross across goal into the back of the net. The goal set the half time score at 2-1, with Roofing showing positive signs but still with a lot of work to do in the second 45. After the interval, and the game was pretty much all Morpeth’s way, with the visitors struggling to get into the final third. 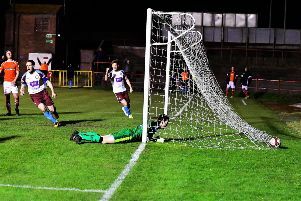 The last of the game’s four goals came on 81 minutes, as substitute Jordan Nellis used his first touch to divert a low pass, into the penalty area, into the back of Regan’s net. Although the Roofers lost, there were plenty of positives from the team on the field, with some good build up play and the effort on the field plain to see.